What starts out as a seemingly ordinary meeting between a University professor and a student becomes an intense fight for survival in a world where no one is right and everyone has too much to lose. One small office becomes a battleground between the sexes where a hidden war we refuse to acknowledge threatens to destroy all the participants. Considered one of the finest playwrights of contemporary theatre, David Mamet uses his prodigious talent to deconstruct and rethink the most controversial and frustrating issues of our time. Bristling with his trademark high-energy dialogue, cutting wit and uncanny insight in the human condition, ?Oleanna? shatters the myths and accepted truths of sexual harassment and political correctness. 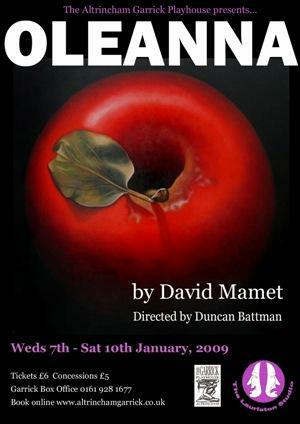 WATCHING?Oleanna?is rather like watching the theatrical equivalent of a boxing match. A pretentious professor and his up tight student with a huge chip on her shoulder verbally slug it out. As a member of the audience it's a draining but ultimately rewarding experience, because David Mamet?s controversial play contains generous helpings of brain food. But there?s one crucial difference between?Oleanna?and the art of pugilism - there?s no chance of either combatant ending up a winner. The two hander features John, the "prof" and Carol, one of his struggling students. Neither character listens to what the other is saying and after a series of unorthodox tutorials, Carol, a strange, strange girl, ends of accusing her teacher of sexual harrassment. It?s hard to feel sorry for John, because he?s irritatingly self satisfied and his accusor is equally lacking in the endearing qualities department. Although the piece leaves you wondering as to why this young lady is so angry and so, so resentful. If Mamet had ever written a sequel, you could imagine Carol boiling his family?s pet rabbit! 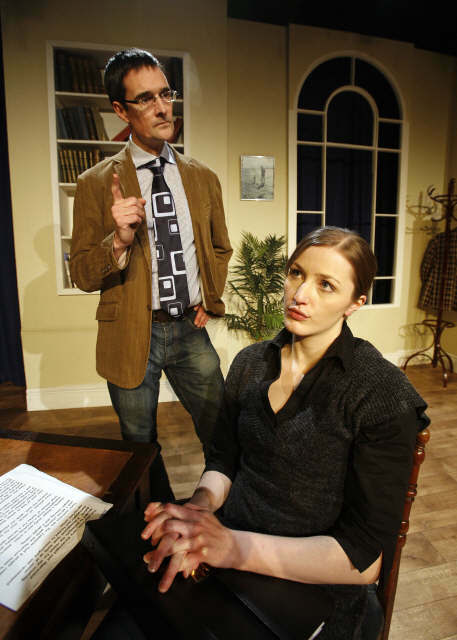 Duncan Battman serves up an assured and engaging production and Simon Royce (John) and Rosi Hunter (Carol) cope extremely well with a script that would stretch the linguistic abilities of professional actors. Not the best advert for the teaching profession, but a thought provoking play all the same.